Once upon a hot summer day we (Mom and I) thought it would be a good idea to get Carl and Bev Beatty, when they lived here in Rocky Point, to show us how to make Kahoola, which is the slang for the coffee liqueur, Kahlua. Through much harassing, pleading and begging, Carl finally agreed to show us his procedure. The first step was to buy the ingredients. We used the white sugar for our first pot, but Carl says you want to use the darker sugar; the darker the better. You also want to use a good, strong instant coffee like Nescafe Ristretto. The first step was to buy the ingredients. The sugar ($13), vanilla ($9) and instant coffee can be found at just about any market in Rocky Point and will run you about $50 – $60 pesos and the grain alcohol can be purchased at any liquor store and runs about $75 pesos. At that price you can tell we use nothing but the finest! Sandy went to buy the grain alcohol (she had already picked up the other ingredients at a market by her house). Tip! You want to use grain alcohol, the cheaper the better, but if you feel like spending more, have at it! Carl says you can also use vodka, if you want, and/or cut down the amount of alcohol you use. Okay, now that we have all the ingredients, we gather the necessary tools, which means raiding Carl’s Kahlua bottle stash. If making Kahoola is something you get into, then it would be in your best interest to mark jugs (plastic or glass) with the measurements, as Carl has done with his (to save you time). Now, with all of the measuring jugs, cups and spoons out, you need to get a big stock pot. This recipe makes about a gallon of hooch. For the first part of the Kahoola making, you put in the 14 cups of water, the 8 cups of sugar and the 8 tablespoon of instant coffee. This mixture you want to let boil for 20 minutes. Boiling longer will burn it! Stir the mixture occasionally but constant stirring is not necessary. Be sure to watch the clock. Boil for no more than 20 minutes or you will burn it and have to start all over! During this time the four of us visited, ate chicken from Pollo Papago and caught up on the latest “Rocky Talk”, which Bev knew plenty of. After the mixture is done boiling, you need to let it cool down. A good idea would be to do the first part in the morning, before you go to work or play for the day, then when you get home at night, the Kahoola sugar/water will already be cooled down and ready for the final step. To get the Kahoola mixture to cool down, you can either leave it set for a while or stick it in a sink, full of cold water. The sink water will need to be changed every few minutes, as it becomes very hot. As we sat there we decided it would be an even better idea to grab a couple of bags of ice to put in the water. After the Kahoola has cooled down, then it is time to add the vanilla and alcohol. We’re almost done! Carl uses his handy-dandy measuring jug to measure out the alcohol and vanilla, then add it to the cooled Kahoola. For the final step you want to add the 4 tablespoons of pure vanilla and the 8 cups of grain alcohol. 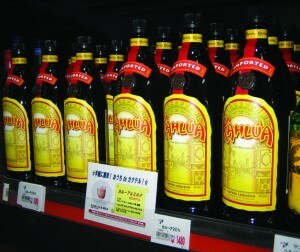 Give it a quick couple stirs and you are now ready to drink your Kahoola! All of us had a little sampling over ice while Carl filled up the bottles! Delicious! We figured, at most, the Kahoola cost us $120 pesos and we filled 7 bottles so it came to apx. $1.93 a bottle! Yahoo Kahoola!